It is believed that the origin of the epidemic was in the city of Caffa, Crimea, where the Mongols who sought to conquer the city threw infected corpses over the walls, thus infecting its inhabitants. Caffa belonged to Genoa, and although a large number of ships were able to escape, many crew members were infected and in the cellars carried enough rats and fleas to spread the disease. These ships dock at Messina, and from there the plague spreads throughout Italy and then throughout the rest of Europe. The dead begin to count in the thousands. 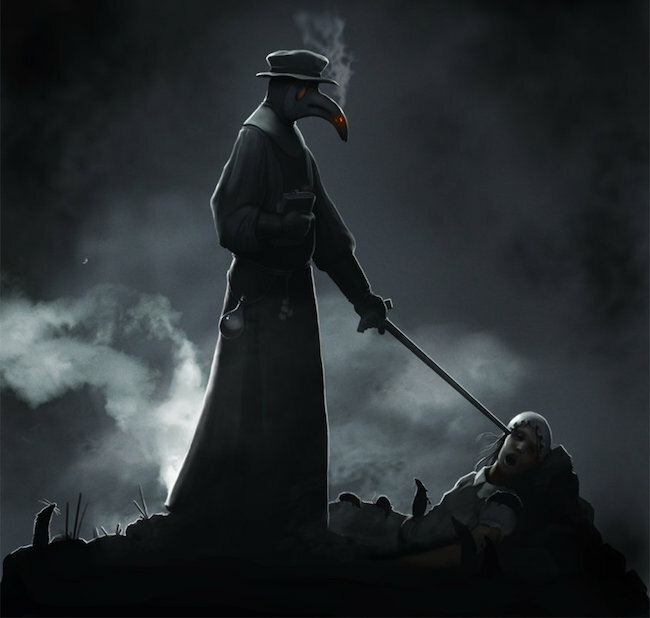 When the plague reached a population, people began to die at a creepy speed; once a person became infected, death came within 3 to 5 days, so panic spread among the people. They sought refuge in churches, healers, alchemists, and amulets, but no one knew where the plague came from or how to end it. The monks of the monasteries died in mass, so the people saw that even prayers could not save them from what they were convinced was the End of the World. At first, people took care of the sick and buried their dead, but very soon the terror is so great, that any trait of humanity begins to disappear. Doctors fled the cities to avoid having to enter the homes of the sick. By the end of the four years of the pandemic, the European population had halved. In the most affected areas, such as Italy, southern France, and Spain, two-thirds of the population died. It was necessary to look for guilty people, so it began to circulate the rumor that the Jews poisoned the sources to kill the Christians, so in addition to the havoc caused by the disease, real massacres were carried out against the Jewish population, that even entire communities were burned at stake. Also, the lepers, the infidels and those who had some disease in the skin, took their part in the distribution of sins. One of the consequences of the Black Death was the change of attitude of the society towards the nobles and the Church. Neither had been able to do anything to stop her. The Church lost some of its power, and many of its powers would be transferred from there to temporal power. The great loss of population brought economic changes. The sudden shortage of cheap labor provided a great incentive for innovation that broke the stagnation of the dark epoch, and because of depopulation. Because of depopulation, the surviving Europeans became the largest consumers of meat.